"I Didn’t Jump, I Was Pushed"
South African student parachutist Lareece Butler was on a training jump on Monday when, according to the UK Telegraph, her chute got tangled and she plummeted to earth at high speed. She wound up with a concussion, a broken leg, and a busted pelvis. Doctors called her survival “a miracle.” That’s bad enough, but in the aftermath the woman’s aunt told the paper that Butler hadn’t jumped out of the plane at all. She’d been pushed. Getting your chute tangled doesn’t have to be a big deal. You’re supposed to jettison it and pull your reserve-chute ripcord. But for an inexperienced jumper, the extreme fear of jumping out of the plane can shut down conscious decision-making, leaving them unable to help themselves. As someone who’s twice stood at the edge of an airplane door, about to jump out, I can tell you that it is about as terrifying an experience as I can imagine. Fortunately for me, both times I was doing a tandem jump, essentially strapped to the front of an experience parachutist like a baby kangaroo. I didn’t have to do any thinking. Which is good. I don’t think I could have. Ms Butler was evidently even more terrified than I was — utterly terrified and unwilling to leave the safety of the doorway. Studies have been done into the experience of fear by skydivers, and it turns out that this moment — and not freefall — is the most terrifying part of the whole experience for first-time jumpers. Psychologist Seymour Epstein at the University of Massachusetts at Amherst conducted a study in which novice jumpers were fitted with heart-rate monitors that measured their pulse as their plane climbed up towards its release point. Epstein found that their heart rates got faster and faster until just before they jump; once they were out of the plane, it declined precipitously. The most stressful part of the whole experience, then, was the immediate anticipation. Compared to that, freefalling was a relief: the jumpers finally understood what they were in for. Intriguingly, the moment of greatest fear is quite different for experienced parachutists. As you’d expect, veterans of many jumps are less fearful overall than novices — they’ve habituated to the danger. But what’s also different is that their moment of greatest anxiety comes not as they stand on the edge of the plane’s doorway, but earlier — several hours before, as the jump looms in the not-too-distant future. I experience a similar dynamic when it comes to flying. I’ve had my pilot’s license for eight years, and I still feel a few butterflies on days when I go flying. But it’s usually before I leave the house. As I drive to the airport, my nerves subside, and by the time I start preflighting the airplane I’m more or less calm. Once the engine starts, it’s all good, and all I’m feeling is the pleasure at being back at the controls of a flying machine. Unfortunately, a lot of people who start learning how to fly never get over the intense anxiety they feel when going up for the first few times. (For the record, I found my first student flights terrifying, yet when I was back on the ground I inexplicably found myself wanting to go back up again.) Having a bad experience or two can make your fear all the more daunting a hurdle. If I had to guess, I’d say that Lareece Butler is not going to make a lifelong hobby of skydiving. Is it that the novice and experienced parachutists reach the same level of fear but at different times? Or is it that they both experience the same level of fear at the same time, but whereas the novice’s fear will continue to escalate till the point of the jump, the experienced parachutist’s fear will subside? What makes the experienced parachuitist’s fear subside? Is it the confidence in skill or perhaps the calming effect of familiar procedure? 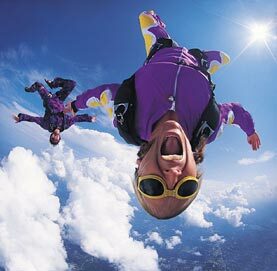 What happens is that the veteran parachutists experience a lower peak of fear, and that peak occurs earlier. In my experience as a pilot, the free-floating anxiety that I feel well before I go flying dissipates as I see the plane, get inside, and put my hands on the controls. As I write in my book, a feeling of control does a lot to diminish fear. Also, I think that I perceive an emotionally positive connection with the physical manifestations of the flight experience, that is the plane and its parts. Thank you for the further explanation. I really want to read your book. Unfortunately, I’ve exceeded my limit of purchased books for the next couple of months. Hopefully once I’ve finished a few I can begin on yours! 🙂 Looking forward to it. Next Next post: Who’s Afraid of the Big, Bad Wolf?